Nozzle: Expectations VS. Reality - IKEUCHI EUROPE B.V.
How to determine a good nozzle performance? How can you see it? Nowadays as a consumer, we are constantly looking for faster delivery, cheaper price, quick response time, in order to be able to fit in a tight budget-and schedule. Living in a digital world, it is also quite easy to have access to goods online and coming from all over the world. But getting a cheaper produced nozzle has consequences for your business. What is the real advantage of getting an equivalent product if its quality is not as promised? Purchasing a cheaper produced nozzle might be interesting in the short term (cheaper price and more quantity purchased) but the consequence on the long term will be costly (repetitive order, increase of maintenance, higher running cost). A good nozzle performance will follow the characteristics as described in the catalog. Each nozzle is designed to provide the same performance within one series. Thus there is no variation in quality between nozzles, compared to low quality ones. You can physically check the nozzle and see if there are any burrs or “teeth” at the orifice. When spraying a nozzle with burrs, you will see streak of waters clearly visible in the water flow. This is an indication of low quality manufacturing product made with imprecise tooling. A spray flow with streaking will have an uneven water density and impact resulting in a larger amount of water consumption, insufficient performance and increase in running cost. As a direct consequence of a cheap production quality is a poor performance. You will not reach the result expected with a disparate spray capacity (streaking) and an irregular spray angle (insufficient coverage). 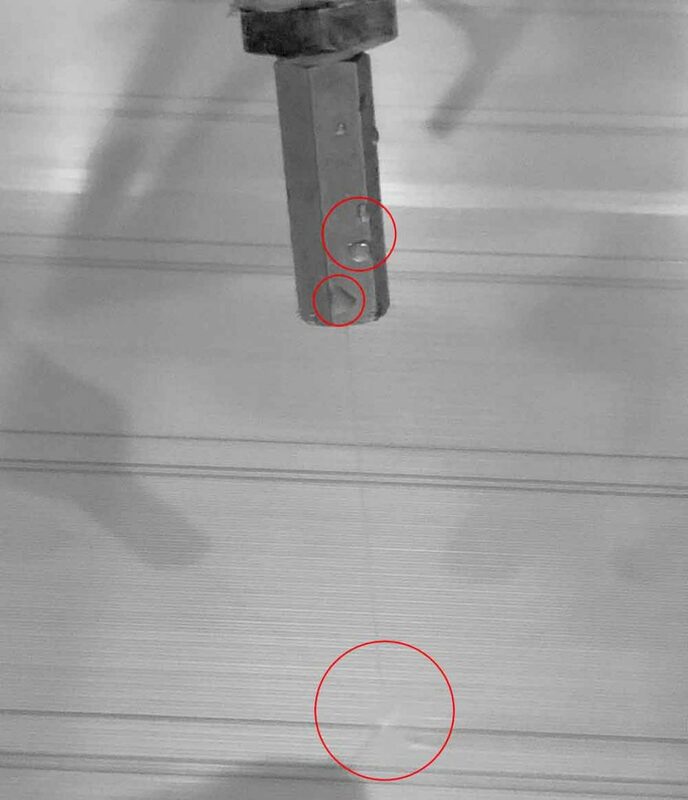 When using nozzles with low and inconsistent quality, it is also difficult for you to design an effective layout and to reach the quality of your end product as expected. The consequence for you to go for a lower unit price nozzles with unsteady performance? You will increase your cost and face a decrease in your productivity and efficiency. How to visually recognize a disparate distribution? 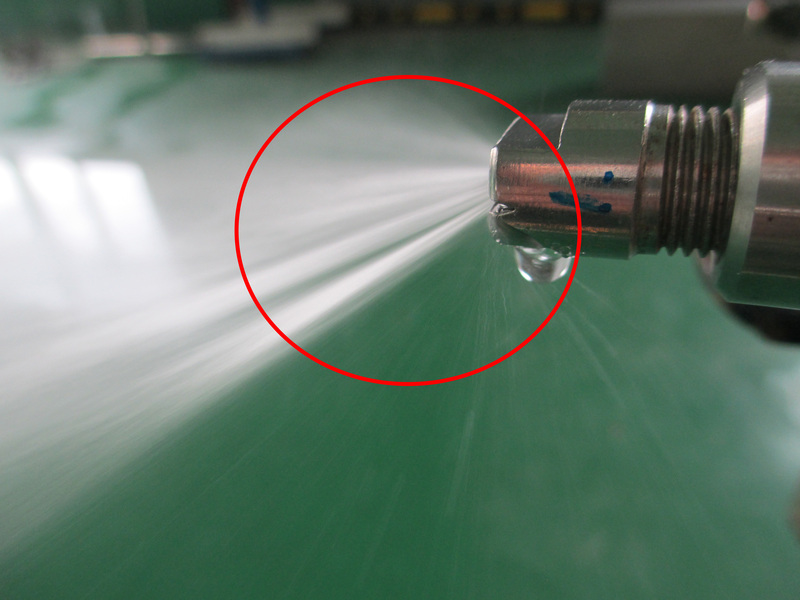 After checking the nozzle’s shape (manufacturing process) and its spraying performance, the most important aspect of the nozzle is the desired impact for the application you are looking for. Let’s take a trimming nozzle example: It needs a straight solid jet to cut perfectly. So what happen if the impact is weaker? Maybe increasing the water pressure would help. But that means increasing your running cost again. What happen if the nozzle drips? This consequence can simple damage the end product if the water drops disturb the production line’s quality. It is thus important to have a stronger impact with less water used for saving cost and increase productivity. Choosing the right nozzle is therefore crucial for your manufacturing process, the quality of your end product, and your productivity by reducing your costs. Benefit of a good performance nozzle to help you deliver a high-quality final product for your business. As a nozzle manufacturer with a high standard, the quality of our nozzles is our priority. Delivering a well manufactured, high-quality nozzle is a standard for our factories and we always test a nozzle per batch of production to keep our promise of high standard.